Korean Japanese Style BBQ Grill Pan + Stove Set. This is the Set for Easy BBQ for your Dining time... The Stove for Charcoal with the BBQ hot Pan grill area with the Soup area around. You can put the Alcohol gel in the bottom instead of Charcoal too or you can use the Picnic Gas Stove work for this pan too. 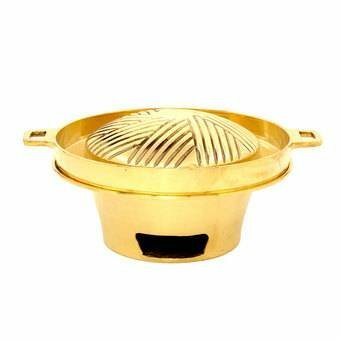 The pan made by Brass with the high standard safety for health. The top of pan can remove easy to clean and wash. If you have any questions about this product by NOINOI, contact us by completing and submitting the form below. If you are looking for a specif part number, please include it with your message.